The Islands and Protected Areas of the Gulf of California is a serial property including 244 islands and oceanic marine zones, described as "the world's aquarium". This site in north-eastern Mexico is home to 39 percent of the world's total marine mammal species and a third of the world's marine cetacean species. 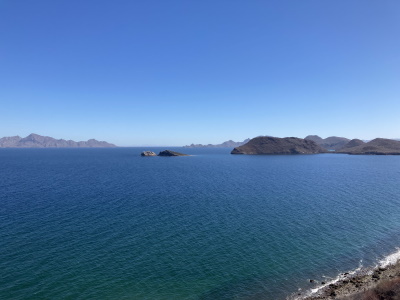 Where I am on the Gulf of California is a perfect example of why this is a UNESCO World Heritage site. In Kino Bay (Bahia de Kino), the desert meets the bay, forming a fascinating juxtaposition of habitats. This area is Eco-oriented, has a full-time Marine Science Center where classes for college students and community members are taught and research data has been being gathered on sea birds, whales and more for years now. The diversity of marine and land life is unique and it is so important to maintain this habitat for current and future generations. The Seri (Comcaac) Nation is just a bit north and this beautiful and talented group of people who have resided here for so long is In the process of passing on their unique language and songs. It is vitally important that this fishing village keeps its focus on the natural world, enhancing the surrounding habitats and providing education about the unique gifts this land offers. The value of this area lies not in being a vacation land and resort for those who wish to escape and play, but, rather, in standing in representation of all that is beautiful, mysterious and pristine on this Earth of ours. Thank you UNESCO. Now, let's the rest of us follow through to make sure this designation is honored. Visit the Gulf of California's crystal-clear waters and you'll thank God you learned to swim. You won't know which way to look as hundreds of fish species swim around you, going about their day in this sunny stretch of water. Bring your sunscreen -- we were sunburned even through the t-shirts we wore snorkeling -- and watch out for sharks; this is prime habitat for both hammerheads and great whites. You'll be grateful you took the plunge, though, and we recommend camping on one of the islands rather than staying in La Paz or (God forbid) one of those tourist traps like Cabo San Lucas. 3.0: Kevin McFarland Svein Heltberg Nolan B. Critically endangered fauna species: Vaquita (a marine mammal) - "a mere 150 individuals remain"
66 Community Members have visited.